The traditional political system is one of global anarchy. Self centered sovereign nations and even corporations, vying for supremacy, are carelessly ruining our environment creating climate change. 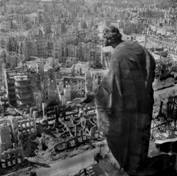 It is an incomprehensibly violent and destructive system as can be seen in Dresden, Hiroshima and Aleppo. It creates deadly danger for all by threatening the use of nuclear weapons. It is expensive due to the costly arms race. It is a nightmare that needs our attention. How can we tolerate and even hang on to such bad global politics? We appeal to political leaders and to all people in the World to change to a better political system before it is too late! A World Federation with legislative, judicial, and executive powers is a better alternative. There is no need to reinvent the wheel. Just expand the experience with national federations to the global level. A Bicameral World Legislature creates world laws. World Courts determine what actions of nations are legal. The World Executive Authority puts pressure on nations that break World Law. Just as well governed federated nations have internal peace; a well governed world will have world peace and protect the Global Commons. The peace dividend will support social and ecological security around the globe.